Pardon the silence on here, still figuring life as I transition back to work. So, I mentioned in a previous post that I worked from home before physically returning to the office. It was definitely a different experience for me. I've had to work from home numerous times before for one reason or the other but never for this long. Today, I'm sharing how it went down and what I took away from it. First of all, what I quickly realized it that every single day is not going to go as planned or be the same, routine wise. What I learned from that is to be able to adapt and welcome change and set reasonable timeline or deadline for work because sometimes, I just couldn't get everything done during regular business hours which meant working extended hours late at night. At the beginning I would promise to have some things done by the end of the day which is 5pm if you’re in the office but I quickly realized that may not always be feasible. For the most part our days starts out the same with loading both kids in the car and dropping Eliana off at daycare. Then I hurry back home with Emmanuel to get on my laptop to get started on work for the day. From there on, it’s just the two of us until 5pm when I have to leave to pick up Eliana. Some days are structured around the baby and his needs and others are structured around work and what needs to get done. Somewhere in between and while working, I have to get Emmanuel showered, call into meetings, if any, nurse on demand, pretty much every 2.5 to 3 hours, pump, make something to eat and sometime towards the end of the day, think about/start dinner prep. One other thing I learned is that it takes patient and honestly being good at multi-tasking to do this. I remember my first conference call I led from home, everything that could go wrong did. I lost connection just a few minutes before the meeting so I had to reboot my computer, which meant I was scrambling to get back online and have everything set up and ready to go remotely with no time to spare. Thankfully presentation was all done, finished last minute. Some people were at the house fixing some minor stuff so they were making noise with their equipment’s in the background, bad planning on my part. Emmanuel woke up just at the beginning of the meeting hungry and was about to start crying. I thought he would sleep through it. The only way to avoid that was to nurse him. So, in the end, I had my phone with headphones in my ear talking to a room full of people, construction background noise going on, and a baby latch on nursing while I was trying to talk and flip through slides of presentation. Not exactly how I had planned it, but we survived, barely. 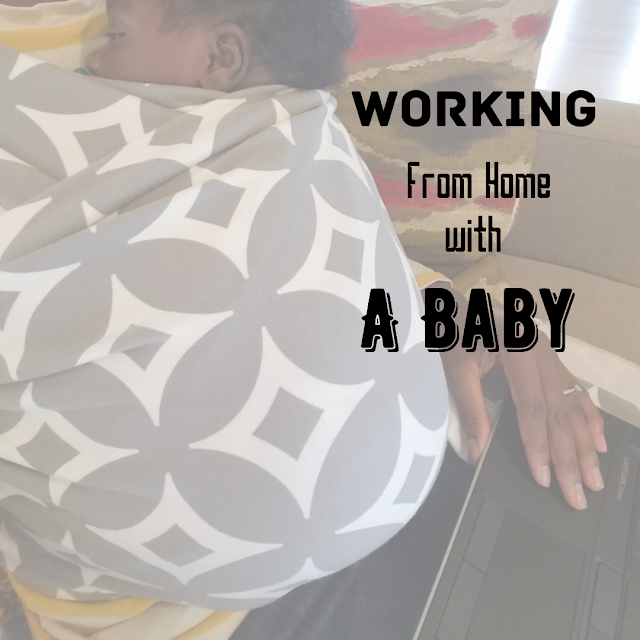 I don’t think it’s impossible to work from home with a baby, but my take away is that it definitely will not be based on a pre defined regular work hours of 8-5. There has to be some flexibility in there because it is impossible to pack a whole day's worth of work and juggling all these other stuff in the background in that pre-set time. Overall, flexibility and setting reasonable deadline for projects and such when needed is the key!